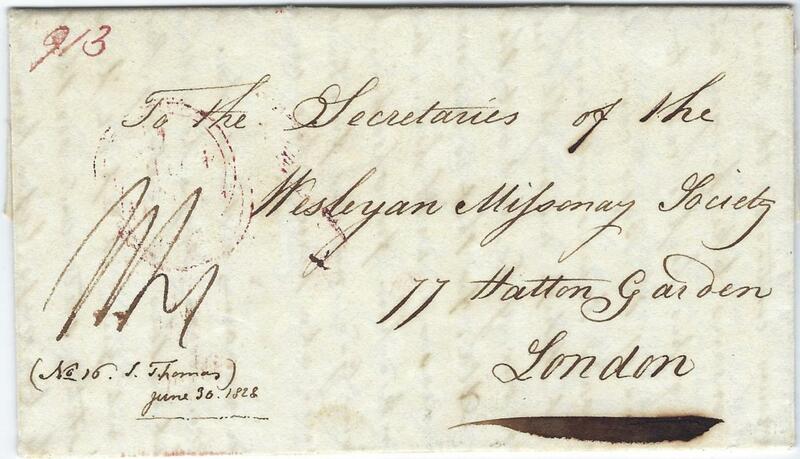 1828 long Missionary entire to the Secretaries of the Wesleyan Missionary Society, London, showing on reverse stepped SHIP LETTER/ DOVER applied on entry into England and arrival cds; fine condition. 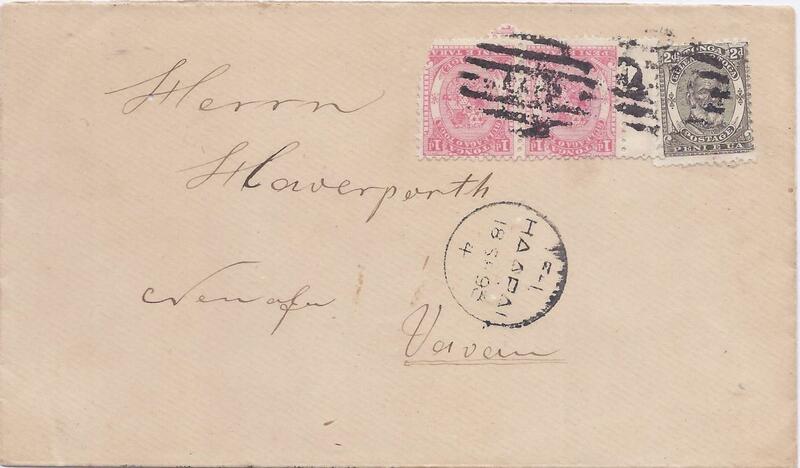 1893 (18 SP) inter-island mail from the Haverporth correspondence with a pair of the 1d. from left-hand pane with adjoining central gutter and single 2d. 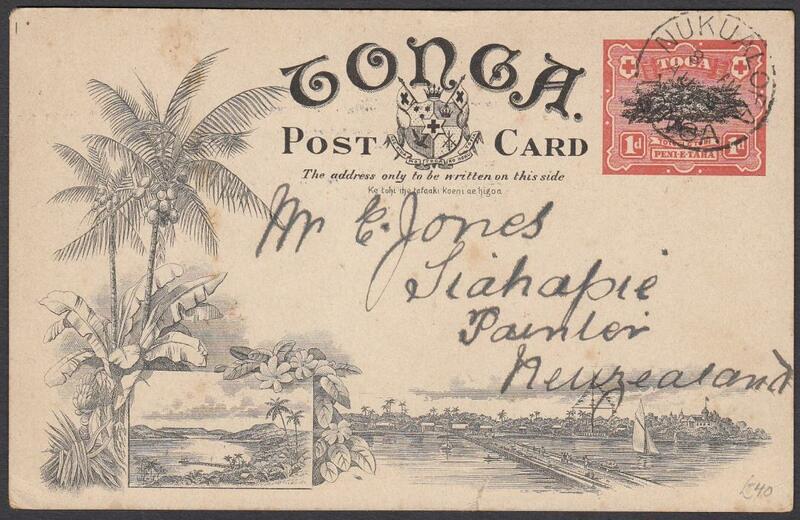 from the 1892 issue, cancelled with Haapai seven bar oval with cds below. One 1d. 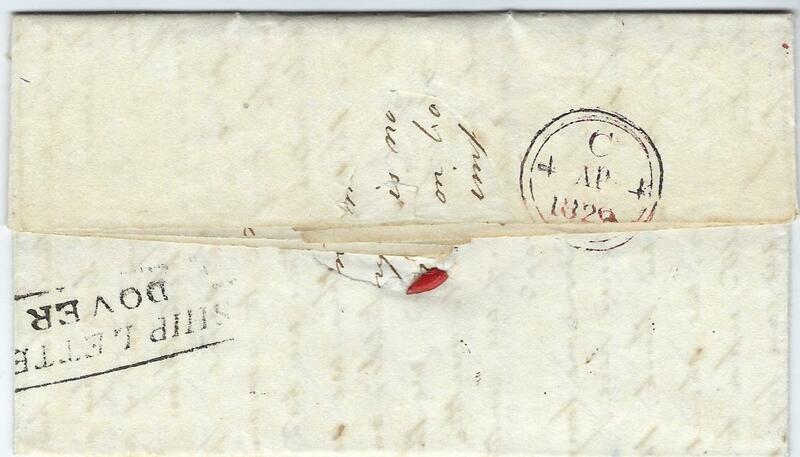 with a rounded corner and small worm hole at left of envelope. 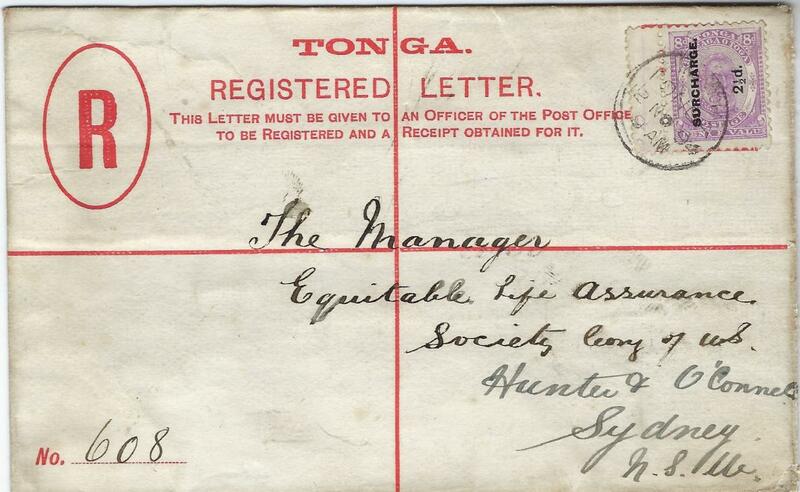 1893 (27 Oct) Tonga Government Frank envelope sent registered to Sydney so uprated with 2 12d. 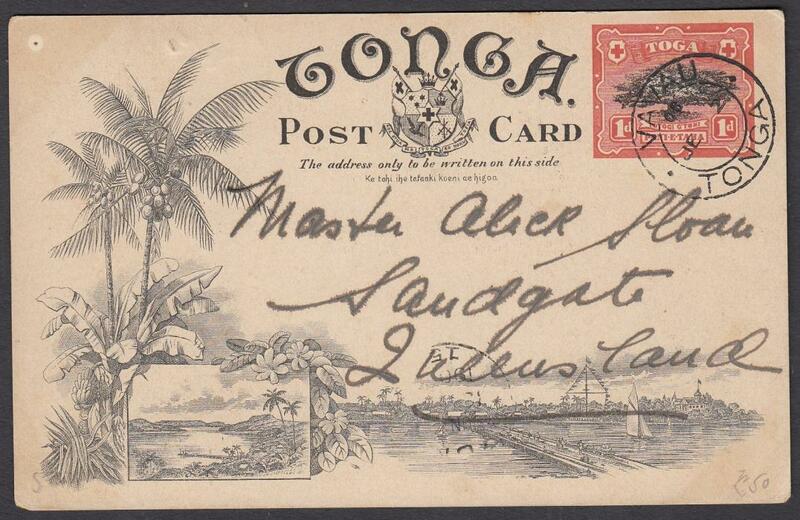 King George II tied Nukualofa cds, violet registration handstamp bottom left, reverse with company chopk and arrival cancel. 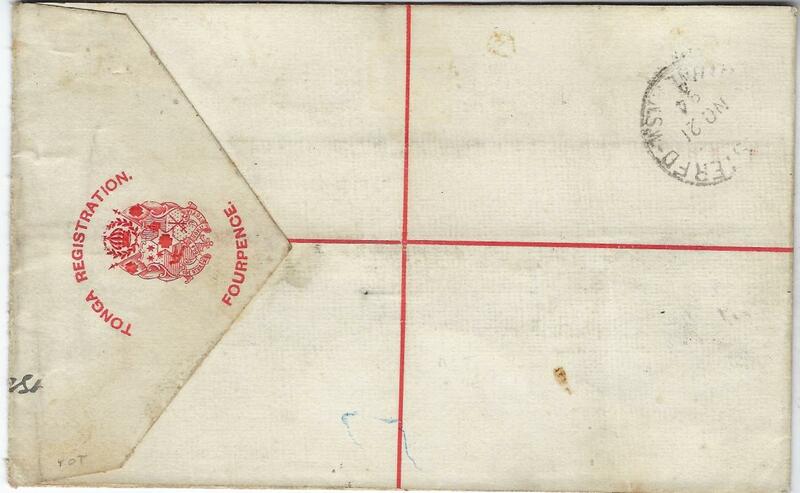 1894 4d formula stationery registration envelope to Sydney uprated Surcharge 2 1/2d. 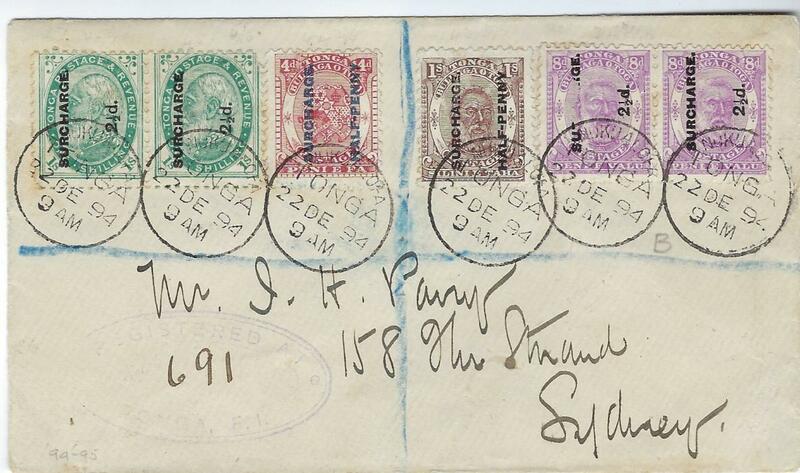 on 8d mauve and tied by neat, slightly ilegible cds, reverse with arrival backstamp; good example, scarce. 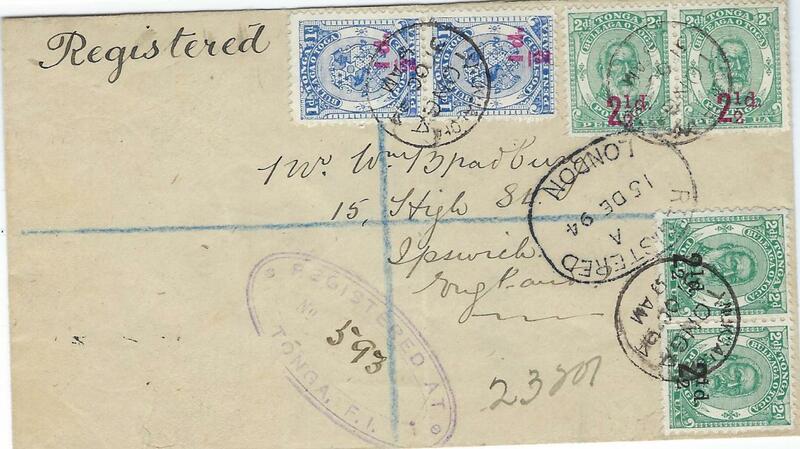 1894 registered cover to England franked vertical pair 1/2d. on 1d. and two pairs of 2 1/2d. on 2d. 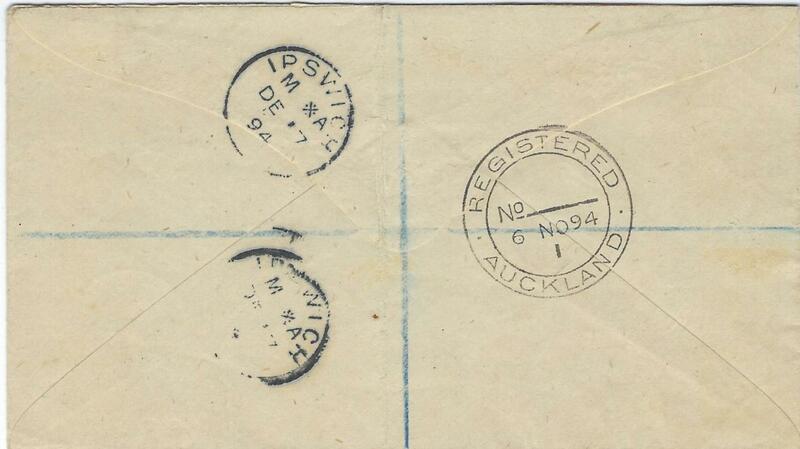 in red and in black tied by neat cds, violet oval registration at centre, London Registration transit, reverse with Registered Auckland transit and Ipswich arrival cancels. The 11d. 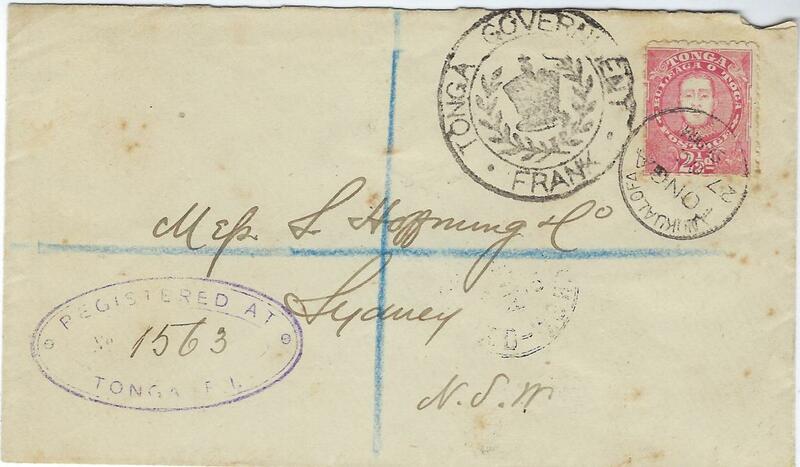 rate paying 6d. 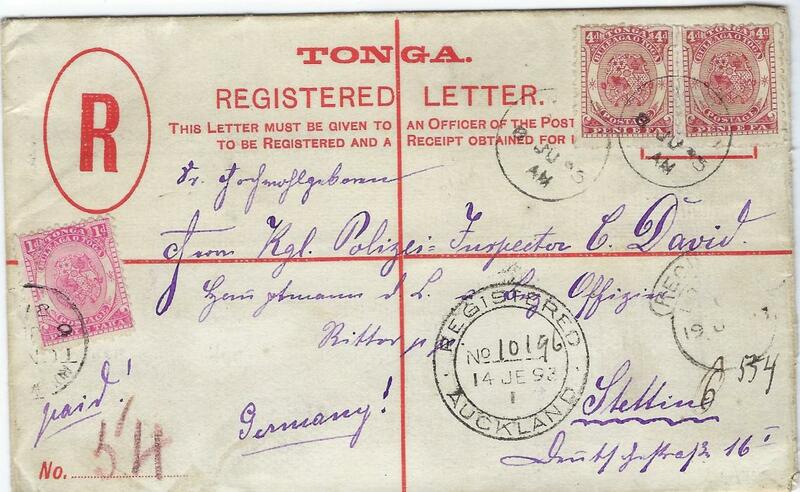 registration and 5d for double weight postage. 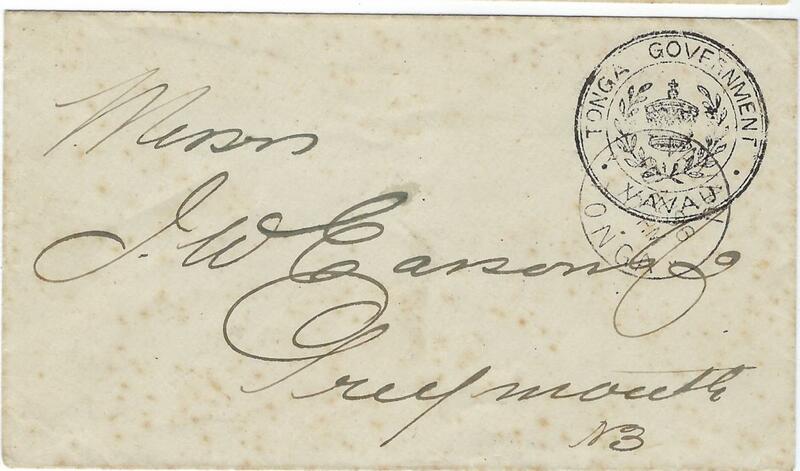 Light vertical crease otherwise fine condition. 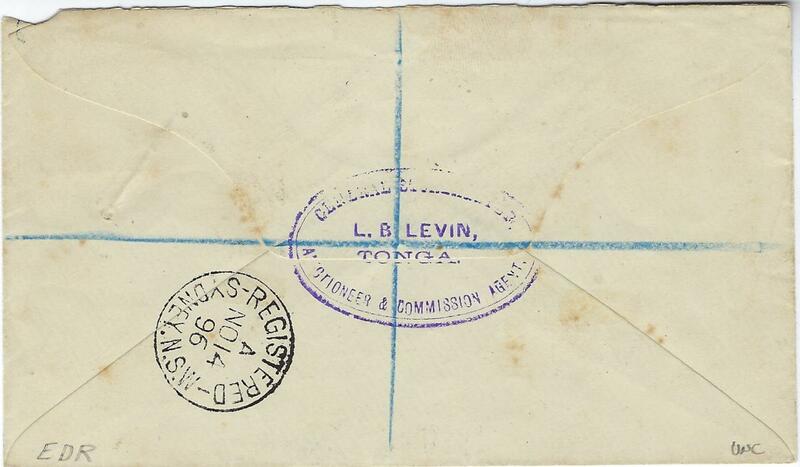 1896 Tonga Government Vavau handstamped cover with frank overstruck by cds, reverse with transit and Auckland cds, some tone spotting, good overseas usage. 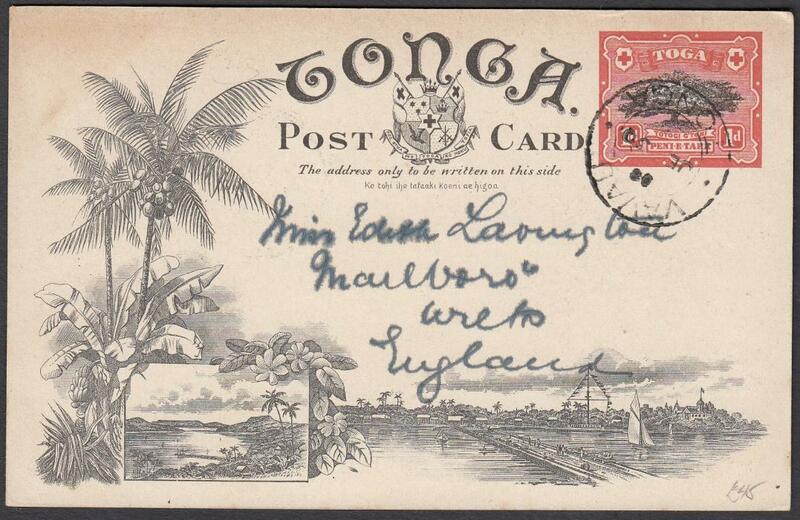 1906 1d. 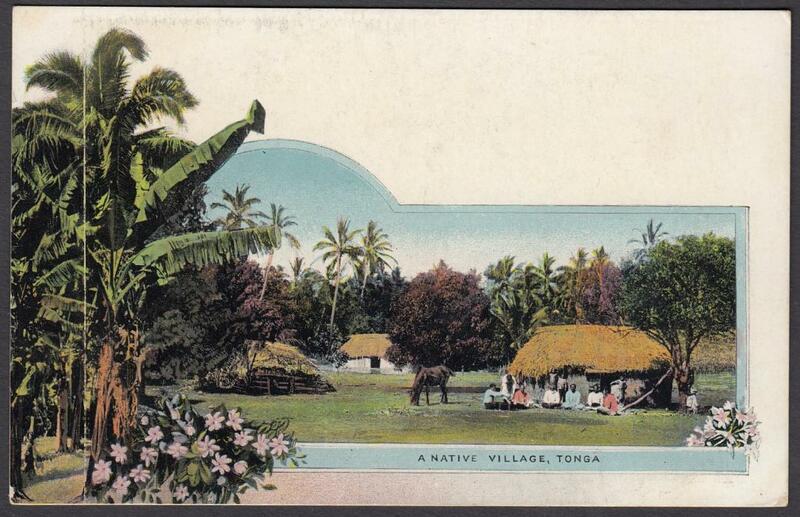 colour picture card 'A Native Village'; unused. 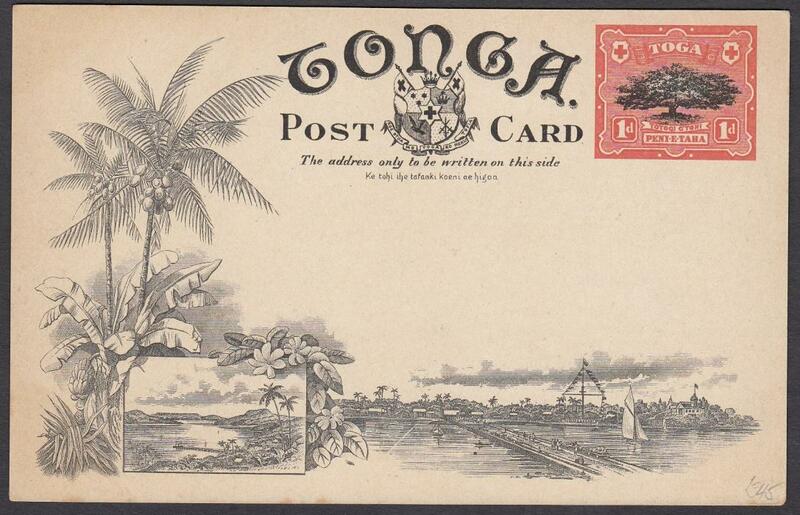 1906 1d. 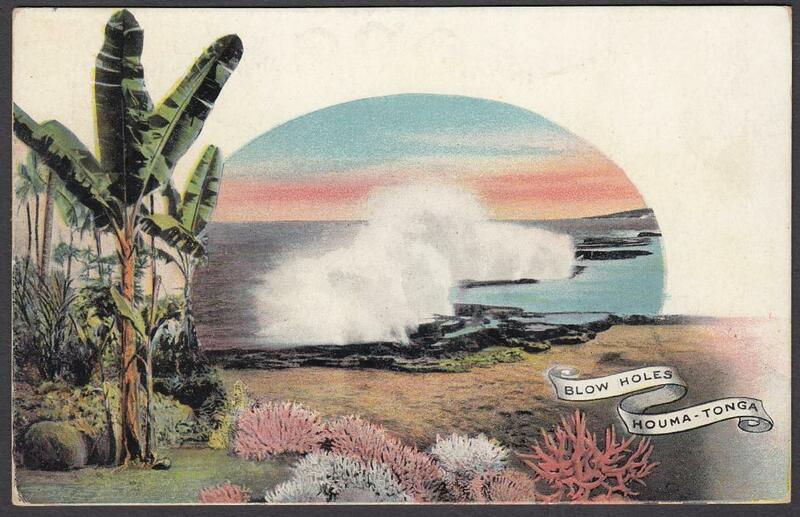 colour picture card 'Blow Holes, Houma'. 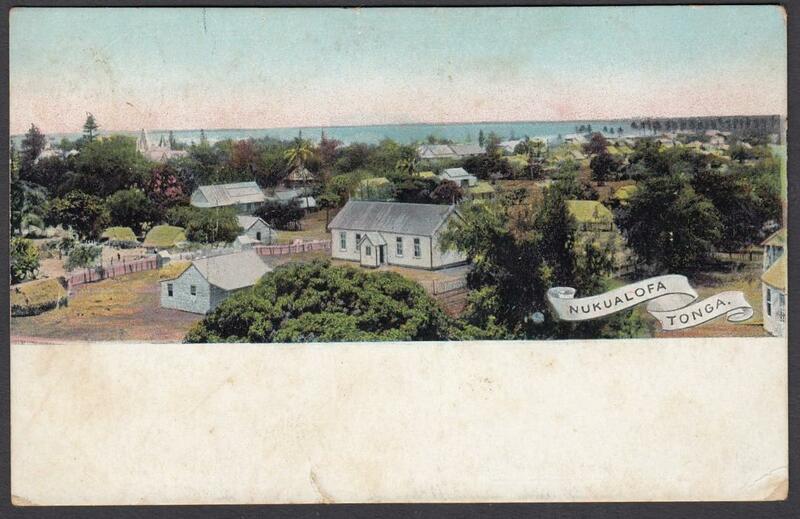 used to Queensland. 1906 1d. 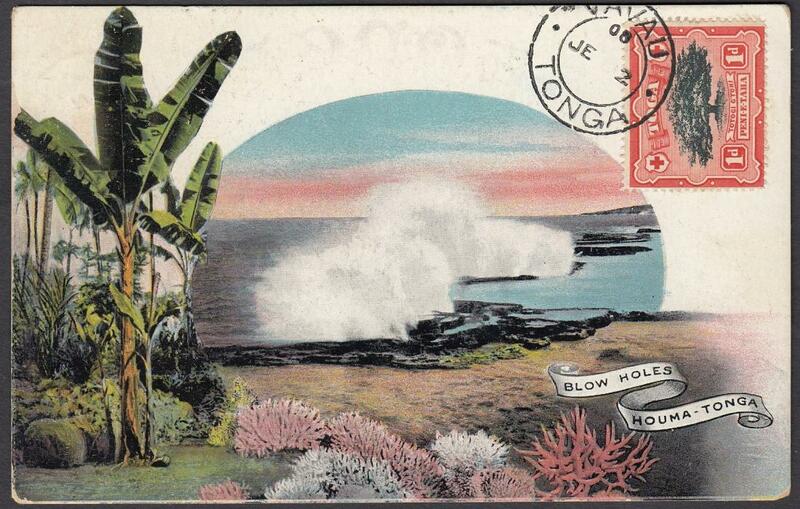 colour picture card 'Blow Holes, Houma'; unused. 1906 1d. 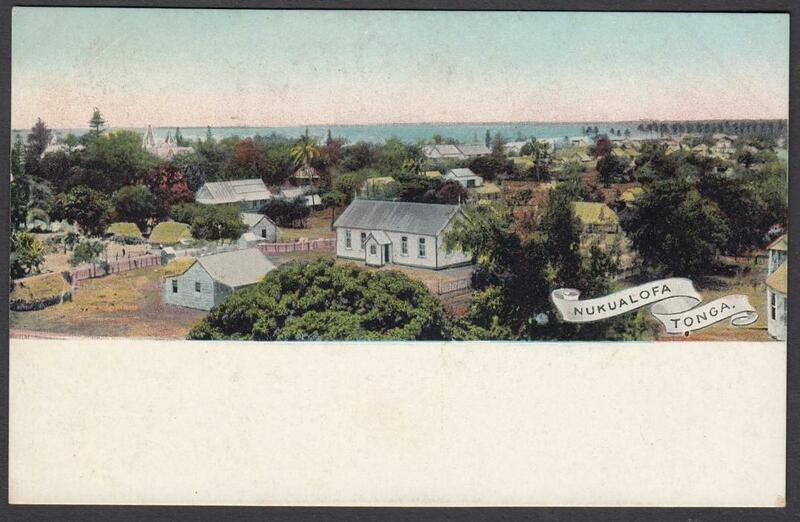 colour picture card 'Nukualofa', used to New Zealand. 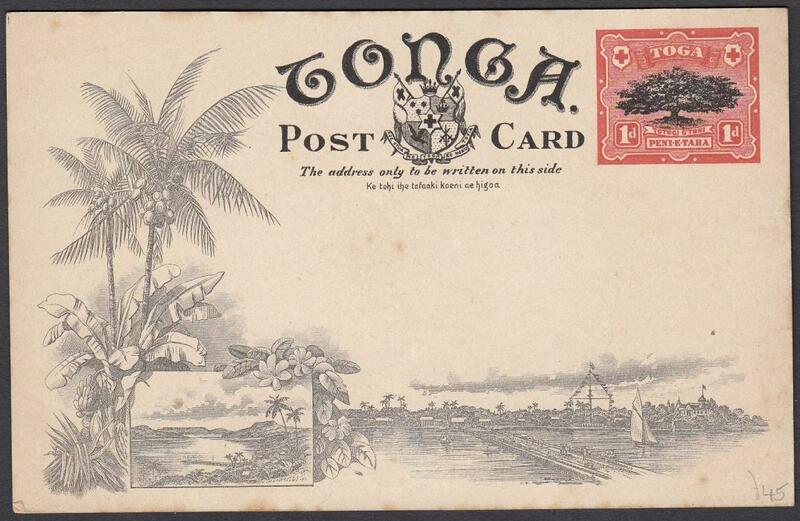 1906 1d. 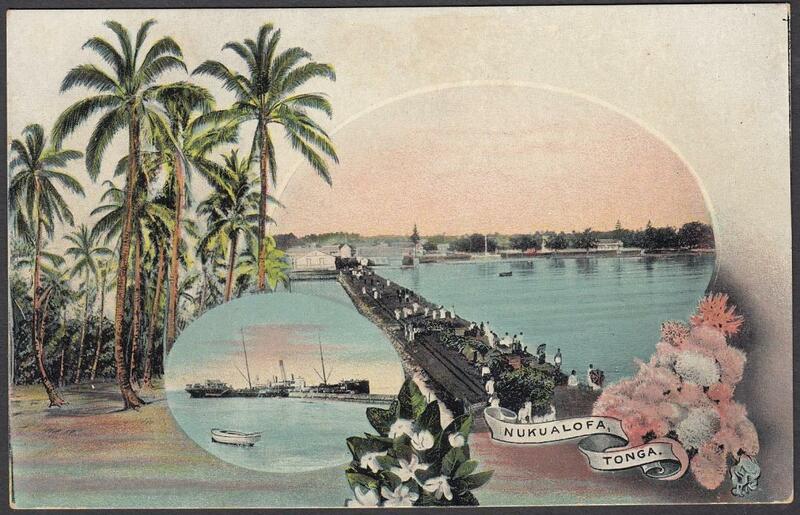 colour picture card 'Nukualofa'; unused. 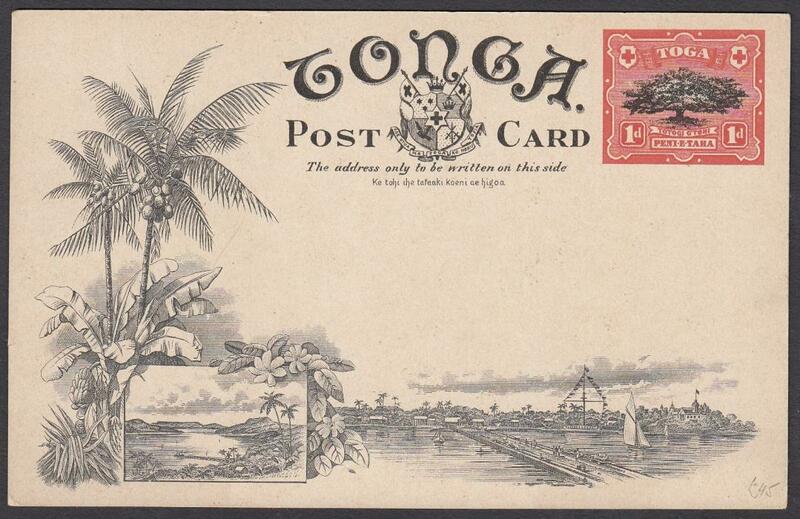 1906 1d. 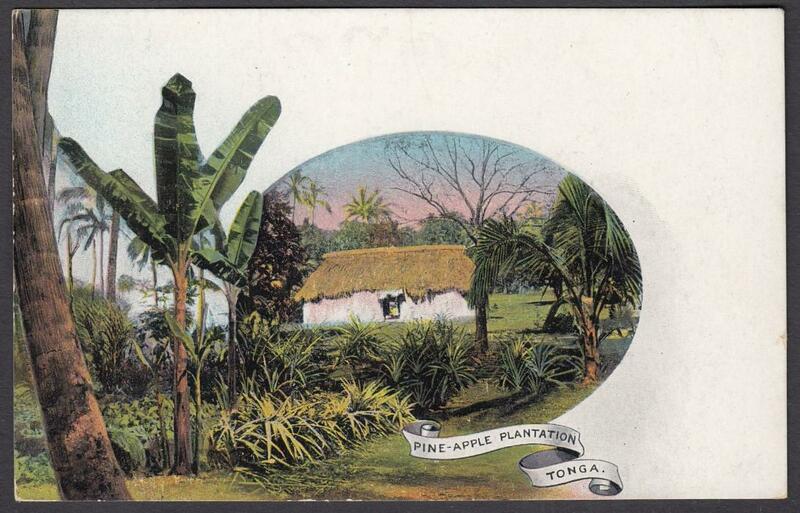 colour picture card 'Pine-Apple Plantation'; unused. 1906 1d. colour picture card 'Stripping Bark for Tappa Making' used to Hamburg, Germany. 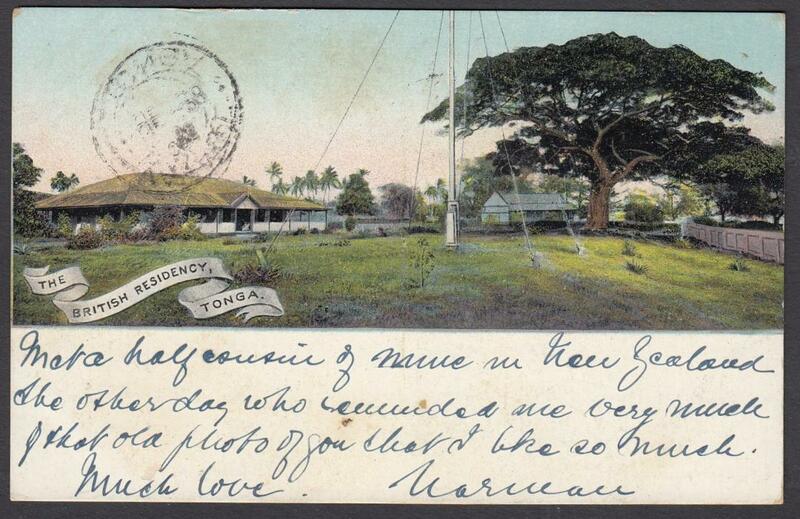 1906 1d. 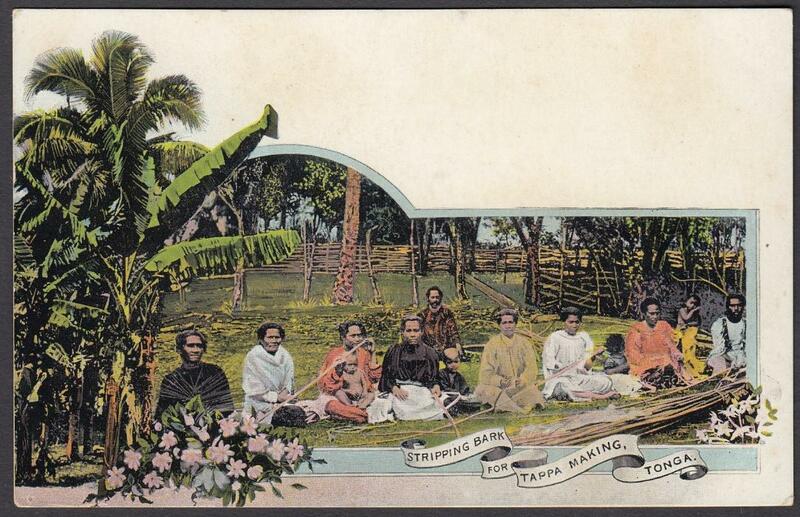 colour picture card 'Stripping Bark for Tappa Making'; unused. 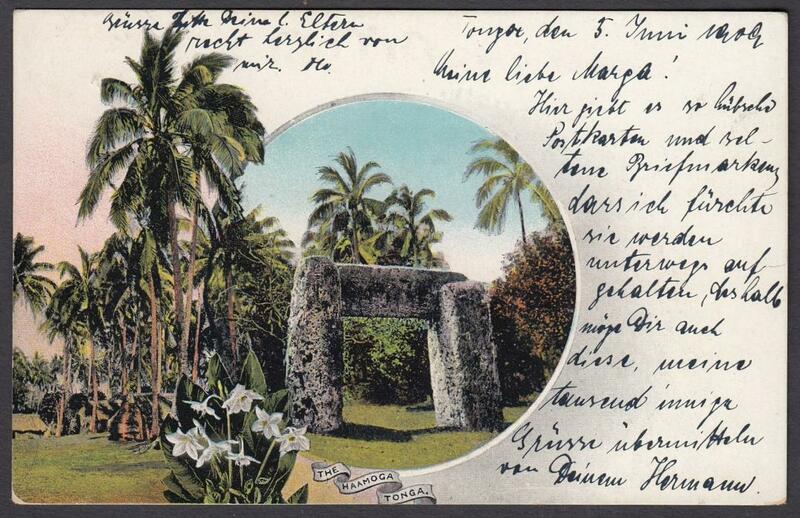 1906 1d. 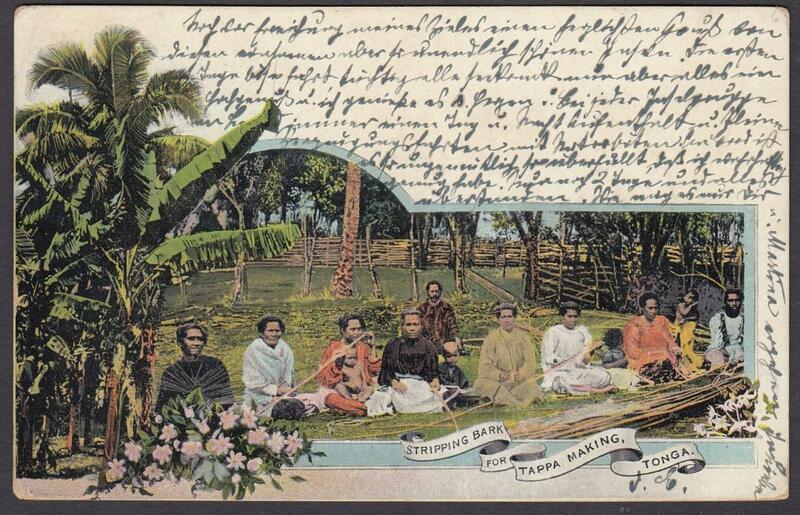 colour picture card 'The British Residency', used to England. 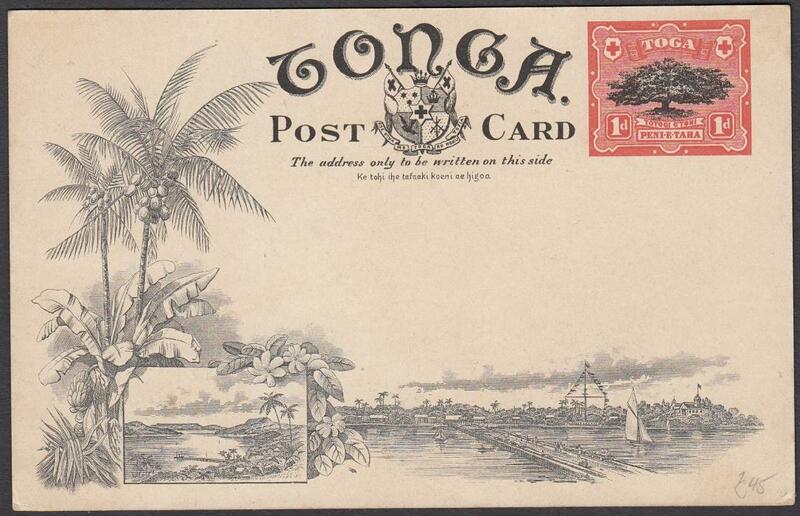 1906 1d. 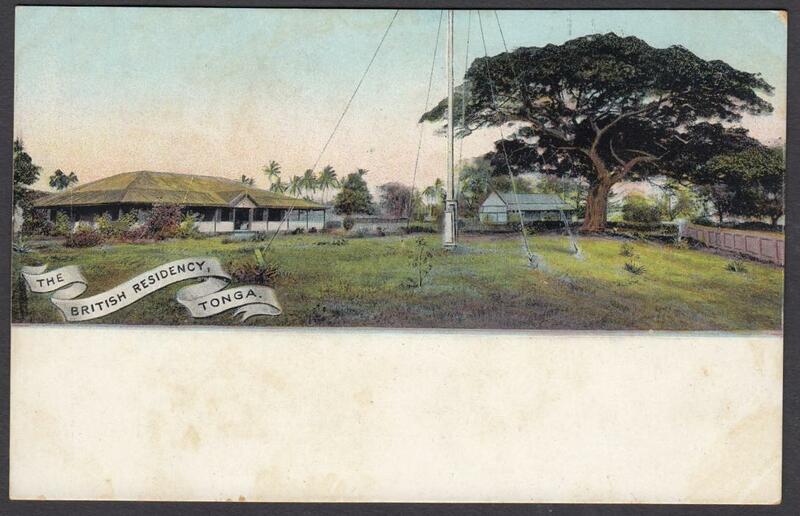 colour picture card 'The British Residency'; unused. 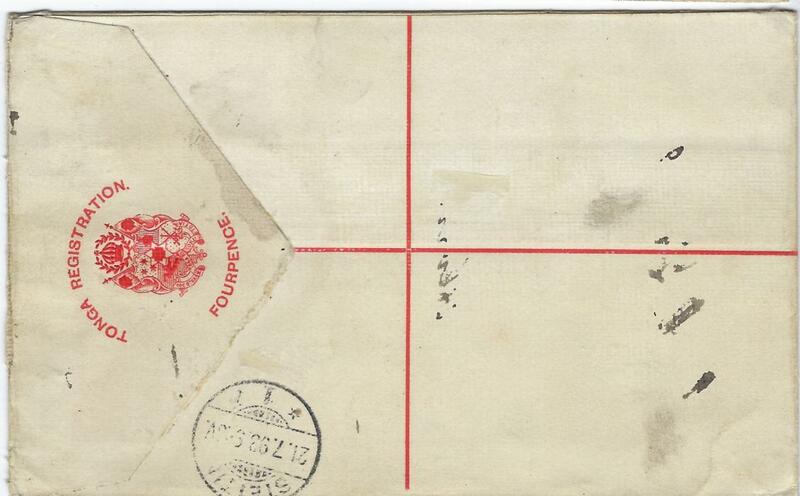 1906 1d. 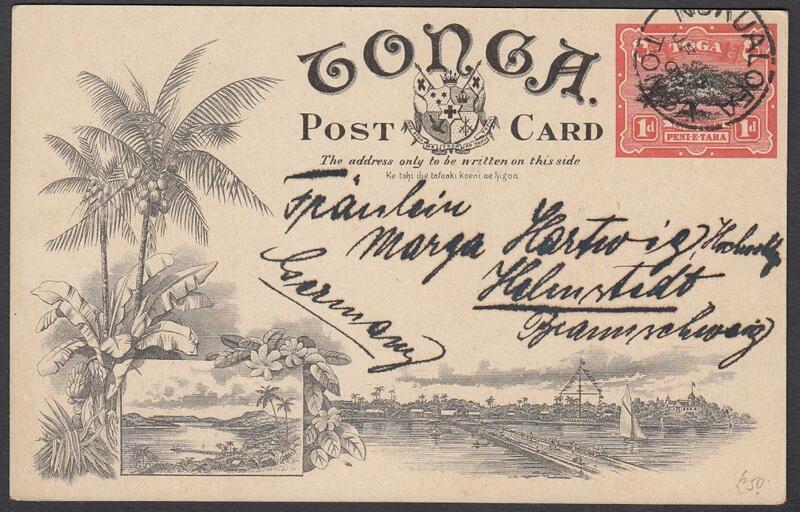 colour picture card 'The Haamoga' used to Germany.